More or less, I agree with this. Currently, the headline risk really isn't being priced into options on financial names. This first bout of news with respect to Foreclosurgate (tm) reminds me of the news trickling out about the eurozone debt issue. We haven't seen the fraud in real estate start to permeate the markets, and it never will-- but it certainly has the potential to do so. Let's first look at some charts. First up is the chart of implied volatility 30 days and 90 days out, courtesy of livevol. This measures the current market expectation of volatility in the future, and if you're bullish on volatility you want to see these charts go up. With the rest of the market, there has been a steady decline in options premiums. Anyone who thought the market was going to be Hindenburg'd this fall and bought puts for protection has seen their puts expire worthless. We are now getting back to levels that we haven't seen since since the market topped earlier this year. This chart has the bollinger bands, the historical volatility, and the average true range. First, the HV is currently a teenager, so the current implied volatility is still running at a premium-- but the realized vol is getting fairly low. The Bolinger band width is very, very tight, which generally indicates that a large move is coming soon. It's also nearing vol levels not seen since the recent market tops. Clearly there is evidence that volatility could come back into the marketplace, especially if the news cycle starts to pick up. So how do we make money off it? Simply put, buying premium has been a disastorous trade over the past few months, and it may continue to do so going into the end of the year. These plays are based on the premise that we will see a large volatility event in the intermediate term, and we seek to profit from it. This is the purest way to trade volatility in the financials. Since XLF is currently between strikes, let's look at a December 14/15 strangle for .65-- that is where you buy the 14 put and the 15 call, looking for a large move. So you profit if we get a strong move to the upside or downside. The breakevens at expiration are the long strikes widened out by the debit-- so 13.35 - 15.65. So if you think the XLF will hit 52 week lows or breakout by Christmas, this trade should make money. Note that you have a bullish vega position, so if the implied volatility on the position increases by 5%, you will see a return of about 30%, all else being equal. If you think that the strangle buy may cost too much, you can finance it by looking at a put sale. This will reduce the overall debit, but limit your downside reward. 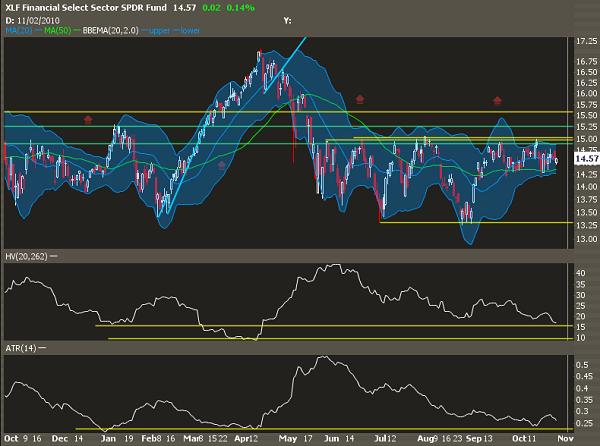 This is better if you have slightly more bullish expectations for the XLF. You can take this strategy and use it on individual financial names (WFC comes to mind), as the OTM skew will be steeper, giving you a better bang for your buck with the put sales. This trade is where you get bullish on volatility, but you have more downside expectations. In this instance we will buy 9 Dec 14 Puts for .33, and 300 stock at market. This requires a little extra cash, but the rewards can be worth it. This is a good trade if you're looking for a fast drop in the market. If XLF hits 13.50, you will lose money in the stock position, but make more money back from the put buys. This is a gamma play, and it works very well if you can trade the nuances and perhaps gamma scalp the name. This trade works even better if you use FAS options. Well we know most of the mess is going to be with BAC if the news starts to take a hold, so we can buy volatility in that name-- but we can also sell volatility in XLF. This is known as volatility dispersion trading. You want the individual stock to move fast but the underlying index to hold its price. The total net debit for the trade is 4.78, but there is more risk than that. If BAC stays dead and XLF rips higher, you will end up being net short the XLF and your BAC vol buy will flounder in time decay. Of course, this is a very advanced trade and would require active mangement, hedging delta and adding/cutting contracts. If you're running a fund and can play with size, what I would do here is look for the XLF components that have the highest exposure to this foreclosure mess and buy a basket of vol in the underlying, then sell vol in FAS or XLF, depending on how you want to swing it. As you can see, options can get progressively more complex and nuanced, and advanced options trading will certainly take you past the basic call or put buying strategies seen in the Options 101 books.